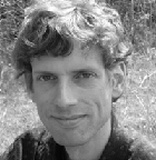 Jay Leeming is the author of Dynamite on a China Plate, a book of poems published by The Backwaters Press. His poems have appeared in a variety of magazines, including Ploughshares, The Gettysburg Review, Poetry East and Black Warrior Review. He has been a featured reader at Butler University, the Omega Institute, Robert Bly’s Great Mother Conference and the Woodstock Poetry Festival. He lives and teaches in Ithaca, New York. Matthew Thorburn's first book is Subject to Change (New Issues, 2004). His poems have also appeared in journals such as The Paris Review, Barrow Street and Pool. He has contributed book reviews to Boston Review, Rattle and Octopus, and writes about writing at www.matthewthorburn.blogspot.com. He lives in New York City, where he works in business development for an international law firm. Matthew Thorburn: How did your first book of poems, Dynamite on A China Plate, come to be published by the Backwaters Press? Jay Leeming: Backwaters, like many small presses, has an annual contest which I entered. If I remember right, it was the 27th contest I entered with this manuscript. It was chosen for their “Editor’s Prize”; all the editors of the press get together and pick their favorite out of all the books that have come through their door. I feel very grateful to have been selected. MT: How did you decide how to organize the poems in your book? Were you conscious of a certain kind of structure or movement that you wanted the book to have? JL: I changed the structure of the book many times. I enjoyed seeing the way different poems would talk to each other across the pages; it’s amazing how much you can learn about your own work by doing this! Things suddenly jump out at you. I wanted to begin with the poems that were most representative of my “style” (for lack of a better word) and then move on to more way-out things. Then I noticed that certain poems tended to group themselves together: political poems, autobiographical poems, somewhat surreal poems. Like fruits falling off a tree and landing in pretty much the same place. In the end I wanted readers to have a fairly smooth ride, so they could wander through the book from one style to the next without two many big shocks. MT: Were there other poets’ books that you looked to as models of how you could or should put a manuscript together? For a while I just grabbed poetry books off the library shelves and read them in one sitting, to get a sense for how they were structured. I think Philip Larkin, Seamus Heaney and Mary Oliver all organize their books brilliantly. I also kept an eye out for whether books were organized in a linear or a more circular way. MT: What have you done to promote your book? Have your promotional activities changed over time since the book first came out? MT: Has the response to your book been what you imagined? Has your writing or teaching life (or other aspects of your life) changed now that you have a book published? JL: Hmmm…what did I imagine? For the most part I’ve been happy with all that’s happened, though it would be nice if it were reviewed in more places. Most of the promotion has been up to me, which gives me a sense of control but has also meant a lot of hard work. The publication of a book also allowed my poetry to move forward in certain ways as well. It was no longer necessary for me to care for the older poems as much, to honor and protect them. In a certain sense, they’re now “safe” and I’ve been able to turn my energies towards other things. Having a book also means that the world takes you more seriously as a poet. That’s a good thing, but it brings with it a certain responsibility and some amount of pressure. MT: Dynamite on a China Plate is a collection of free verse poems, including some prose poems. But more recently, you published a chapbook of ghazals, Live From the Nightclub of a Thousand Failures, in Black Warrior Review, and have also done a lot of work with renga and haiku, as well as villanelles and sonnets. Tell me about your interest in these forms. How did you come to the ghazal and renga traditions, in particular, and what draws you to working with them? JL: I came across these forms in the work of other writers; specifically, I read the ghazals of Robert Bly and Jim Harrison and was inspired by them. I discovered renga through Earl Miner’s excellent book, Japanese Linked Poetry. The ghazal interested me because of its fragmentary, mosaic-like nature. It offered me a new way of jumping from one subject to the next. I also enjoyed the challenge of seeing how much I could stuff into a single stanza. The rise and fall of the Roman empire? A Bach fugue? Also, it gives the author the freedom to make a statement and then immediately abandon it, with no pressure to develop it further. This freed me up in a good way. Renga interests me because of the way it embodies transience and loss. It’s a more somber form than the ghazal. It is less jagged, less explosive; it feels more autumnal to me on the whole. And in some ways, it moves in the opposite direction from a ghazal; one moves towards fragmentation, the other begins in fragmentation and moves towards wholeness. I was inspired by what I saw in Miner’s translations of the poet Sogi, and by the haikai (basically “renga” by another name) of Basho and his circle. MT: I know you have a second book manuscript out there now. Has your approach to finding a publisher been different for your second book? JL: My approach hasn’t been very different; know something about the publisher you’re sending to, and then just dive into the river. MT: What advice would you give a poet looking to publish his or her first book? JL: Well, first off, don’t think about it too much. I find that concerning yourself too much with “where’s this thing going to end up?” can warp your writing-practice out of shape. But once it has blossomed into its fullness, so to speak, I would say that the best strategy is to get to know the various publishing houses that are out there. Once you have a good idea of what they like to publish, you can send your manuscript to a place where it will really find a home. We’re talking about real relationships here – seeds in the ground, not just fly-by-night books tossed out the door. MT: Let’s back up for a minute. I want to ask you that age-old interview question – and something I realized I don’t know about you, though we’ve been friends for years now: how did you get started writing poems? JL: I’ve been drawn to the life of the imagination from a young age. I’ve always written poems and stories. But music really caught me in high school, and I then learned to play guitar and followed that path very seriously. Songwriting was my training ground for poetry writing, in many ways. Gradually the poetry in my life became more of the center of things than the music. And here I am now, somewhere (driving? hitch-hiking? crawling?) on this long poetry trail that vanishes into dusk and dawn at either end. MT: A feature on Paul Muldoon in Poets & Writers noted that he’s the lyricist and plays guitar in a rock band called Racket. I know that you have also been the lead guitarist, singer and songwriter for two bands, The Diving Bells and Joy Buzzer. How do songwriting and poem-writing intersect or diverge for you? Do you ever start writing something as a song that winds up as a poem? Or vice-versa? JL: Now this is a big question that goes back to lyres and harmonicas and goat-skin drums! Nowadays, for me a poem is a poem and a song is a song. Rarely do words or ideas or images from one jump to the other, and when they do it generally feels a bit cobbled-together. In fact, now that I think about it, it’s always been that way. For me, the lyrics of a song have to be securely rooted in the melody, which is rooted in the chord changes – it’s all of a piece. It’s very hard to graft on words from somewhere else. The difference with a poem is that the poet has complete control over the sound of what she or he is creating; it is not something that will be added to later. Certainly, however, having spent a lot of time writing words to be sung has helped my poetry a great deal. It’s made me more attentive to the sound of language, aware of its sudden shifts and turns, aware of the way a sound can drag you into thoughts you didn’t intend to say. Finally, in many ways a song is more restrictive than a free-verse poem; you have to fit your words to certain melodies, within a certain time-frame. It’s like writing a sonnet or a villanelle. For that reason, I’ve found poetry to be a medium where I’m able to be more honest, to really say what I want to say. It’s also easier to be an adult in the poetry world, and to be in touch with tradition; the rock music world is, because of the markets that drive it, largely a young person’s medium. MT: Rather than teaching at a college, as many poets do (or aspire to do), you make a living teaching creative writing in the community. Would you tell us about your experiences teaching at the Community School for Music and Arts, the Lifelong Center for Senior Citizens, your one-on-one poetry mentoring and – most recently – your “Poetry on the Porch” seminars? JL: Since August of 2006, I’ve been seizing every poetry-teaching opportunity I can get my hands on, and it’s been an interesting ride. I’ve been lucky enough to teach senior citizens, third graders, and folks in between. I’ve enjoyed the freedom that comes with this sort of teaching, and the ways in which I’m able to get poetry into the community. The main downside is the uncertainty that comes with it, both economic and otherwise. But most of it has been a great gift to me. I’ve enjoyed seeing poetry flourish in a wide variety of places. Most recently, I’ve enjoyed working with third graders – their inspiration seems limitless! I’ve also enjoyed teaching poetry on my porch, where a group of students and I have delved into such topics as Anglo-Saxon poetry, Persian poetry, and poetry of the Spanish Civil War. MT: More recently, you’ve also been leading workshops in England. Do you see differences in your students’ work in England, versus those in America? JL: I expected to see many differences, but have been surprised by the lack of them. On the whole, English poetry is more formally and metrically oriented – but that’s “on the whole” and is a perception that shouldn’t be taken too far. Folks over there read William Carlos Williams and listen (or have listened) to Bob Dylan and Public Enemy, and the perception of England as both the source and protector of a certain way of writing is only half-true. MT: Does teaching poetry help you as a writer? JL: It helps me think about writing, and gives me the opportunity to share good poetry with others; it also forces me to make my own thoughts about poetry clear, and allows me the luxury of learning from other’s points of view. So it does help me as a writer to some extent. But it is not to be confused with the quite different work of writing poems. And there is also the danger of talking about poetry so much that you get our of touch with its wild, irrational, and unconscious sources. MT: I’m curious to hear your answer to this next question in part because we were in The New School’s MFA program together, and so have had some of the same teachers. Who are the teachers who have meant the most to you as a poet? JL: I’ve learned so much from poets I’ve never met, of course, that this question is complicated. However, when thinking only of teachers I’ve actually been in the room with the list is shorter. I’ve learned a lot from Robert Bly; his love of poetry is incredible, and the breadth of his knowledge is amazing. He is tremendously loyal to the spirit of poetry, and his translations in particular have opened my imagination up in a lot of good ways. While in New York I learned a lot from David Lehman. I also learned a lot from teachers I had much earlier, such as a third grade teacher named Mrs. Ehrenburg who got us to keep journals, and a creative writing teacher I had in high school named Mr. Thibadeau. MT: I know for a long time you wrote a poem every morning. Is that a practice you still maintain? What are the benefits of writing every day? The drawbacks? JL: That was a great way to help the editor inside of me relax. Just write a poem, good or bad, that’s all you have to do! No big deal! It also inspired me to try new and wild things I hadn’t tried before. Those are the benefits. One drawback is a certain shallow quality which can enter in – I found it hard to dig down deep, which is much easier if you can sit with something for awhile. Sometimes it’s best to spend time not writing at all, letting your thoughts and impulses develop off the page. To put it in mythological terms, it’s a very mercurial exercise; it’s all about the quick flash, the sudden zip of new language on the page. But good poetry requires the gifts of Saturn also; structure, emotional weight, and the expression of insights arrived at slowly, over a long period of time. All in all, however, it was a great task to set myself, and I learned a lot from doing it. MT: Tell me about your writing process. How does a poem start for you? And mechanically, how do you work – notebook and pen? Straight to the computer? JL: Notebook and pen, then computer later. I find that bringing the poem to the computer too soon can distract me from the poem’s source; it leads me to focus on the poem’s public face, its eventual home in a typeface that the world (hopefully) will see. It’s harder to stare into space when you’ve got a computer in front of you. On longer poems, though, the computer comes in much sooner to make editing easier. And there are some poems I have written directly on the computer. Poems start in many different ways – sometimes with a phrase, sometimes with a vision of some kind, an image... sometimes as an idea. I try to keep all the roads open and as free of potholes, barricades and security guards as possible. MT: Do you tend to revise poems a lot? Is there a particular poem (or poems) in your book that you remember struggling through a lot of drafts to get right? JL: I do revise a great deal. That’s where things really get polished. “The Barber” took a lot of work to get its sentences to flow smoothly through four-line stanzas. “Boxes and Oceans” took a long time for similar reasons. There was a lot to fit into those boxes! MT: And which poem came the quickest? JL: “The Comedian’s Ten Songs” is made up of little quatrains I wrote first thing in the morning over about a month. I then picked my favorite ones and put them together. All the poems in the second section of the book were morning poems, written immediately upon waking, and have much less revision then poems in other parts of the book. MT: Do you focus on one poem at a time, or do you move back and forth between a number of poems in progress? JL: I move around, wandering desperately from one broken-down poetic car to the next, replacing alternators and starters and transmissions, trying to get the engine of one of them to turn over and actually go somewhere. Sometimes I stick with one poem for a long time, but that’s rare. MT: Which is your favorite poem in the book? JL: Today I like “Rowboat.” It feels very complete to me, and arrives home very nicely. MT: What are you reading these days? What are some books you read recently that you’d recommend? JL: I read The Spell of the Sensuous by David Abram and loved it. It helped deepen my connection to language and to the natural world around us. Also loved Tony Hoagland’s What Narcissism Means to Me. Now I’m reading Don Quixote as I’m doing a lot of traveling, and it’s a good long book to have when you’re sitting in an airport. MT: Where can we find some of your recent work? JL: There’s a sonnet of mine on the Cortland Review online; there’s a link on my website. I’ve got a poem in an issue of Poetry East coming out next year. Other than that – it will all be in the second book! MT: What are you working on right now? JL: New poems! Lately it’s been longer, meditative poems, but I’ve also had some condensed, shorter things come my way. Whatever comes floating down the poetic river I usually try to wrestle or guide into some sort of shape – I just try to stay as open as possible, like a hole in a fencepost with the wind whistling through it.